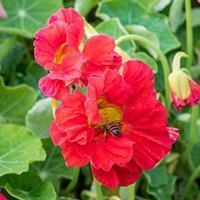 Mounds of sea green foliage support a bevy of rosy red double blooms that age to rose, all with sunny yellow centers. Our new favorite double nasturtium with great flower power, outstanding in early summer and early fall when the summer heat wanes. Small, dark blue-green leaves and smoldering dark scarlet flowers make a striking contrast on this Victorian era heirloom. The neat mounded habit makes it suitable for containers and garden edging. The flowers and leaves have a peppery taste that spices up salads, vegetables and pasta dishes.